2016-2017 - St. Lachteens N.S. Our last assembly for the year was a really special assembly because it was Mr. Condron's final assembly in our school. First class put on a fantastic performance of many songs from musicals. They were brilliant! Their parents came to watch them and every child in the school really enjoyed their performance. Mrs. McCarthy wrotean incredible poem to say goodbye to Mr. Condron. She used every letter in the alphabet from A-Z! We then made presentations to Mr. Condron. We'll be very sad to see him leave but we wish him all the best in his new school. Go n-éirí an t-ádh leat Mr. Condron. Our end of year magazine featuring photos and articles by the pupils on activities that they have enjoyed during the year is now available to purchase for €2 from the school. Thank you to Fr. O'Riordan for celebrating a very special graduation mass for our sixth class pupils. 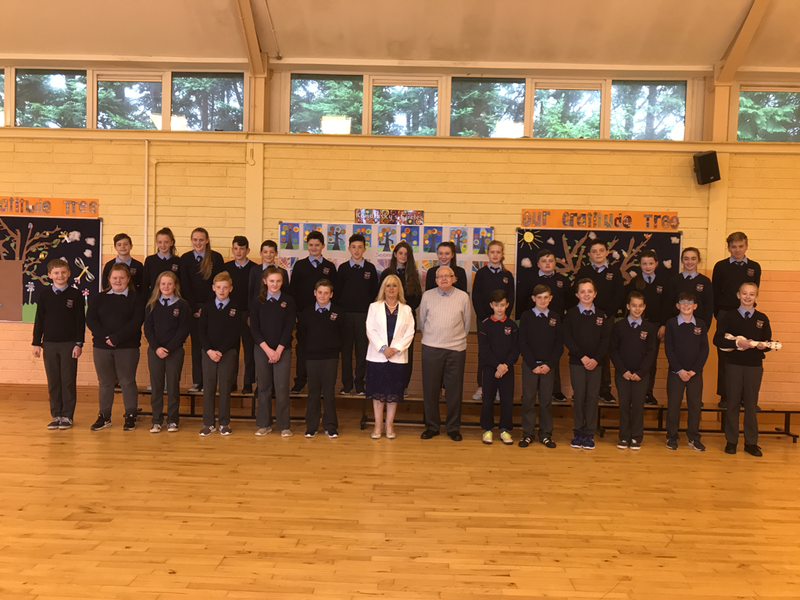 Afterwards we all went to the hall and Mrs. McCarthy spoke about each pupil in sixth class before they were presented with a certificate by our guest Macra President James Healy. We were delighted to welcome James a past pupil back to our school for this wonderful occasion, thank you James. Thank you to all who helped in any way for this special day. 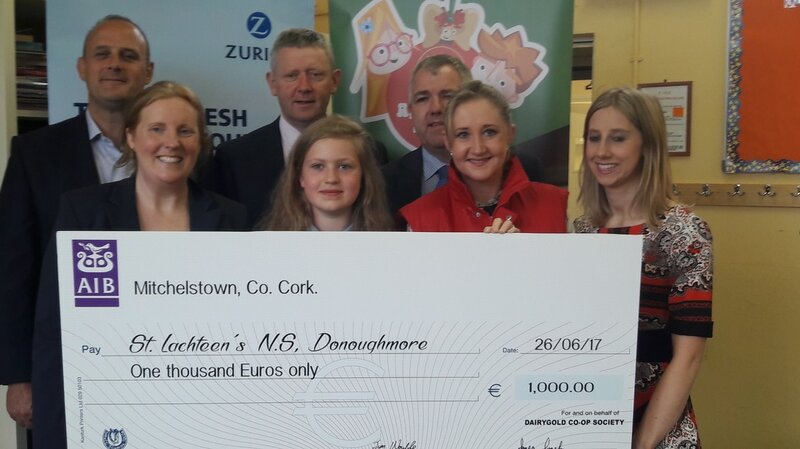 We are extremely proud of Ciara who has won the national Dairygold and Zurich "Farm Safety Pledge" competition. Fifth and sixth class pupils were asked to create a farm safety poster. All the pupils in the class put lots of effort into their detailed drawings and their slogans. Ciara's exceptional poster was chosen by the judges out of entrants from across the country. She has won €250 and €1000 for the school. For more details see the Dairygold website. 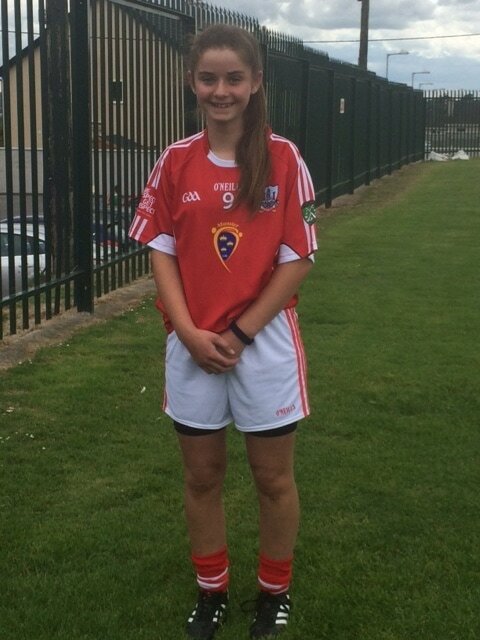 Congratulations to Kelly who will represent our school and parish when she togs out for Cork Primary Games during half time of the Cork v Clare Munster Hurling Final in Semple Stadium, Thurles. This is a fantastic honour and we look forward to supporting you there. Our school featured in the Kidz Zone supplement of the Evening Echo on Thursday 22nd June. It features beautiful photos of our pupils along with articles that the pupils wrote about our school - we may have some budding journalists in our midst! Over the past months in fifth and sixth class we have been very busy preparing for our public speaking event. On Wednesday night we welcomed our parents to the school for this special event. We were divided into five groups. Each group had a different topic. Within each group we had a chairperson, a pupil speaking for the motion, a pupil speaking against the motion and a pupil with a balanced view on the motion. Everyone presented their speeches so well on the night. We are extremely proud of them all. Thank you to Ella and Frankie Honohan who have just completed first year for coming back to give our sixth class tips and answer all their questions about secondary school. It certainly put their mind at ease before the summer holidays. Thank you for sharing your experiences, we were delighted to welcome you back to St. Lachteen's N.S. Active week was a huge success. Pupils in all classes took part in a variety of activities such as 'walk a while with a smile', a teddy bears picnic, tug of war, drop everything and dance, wake up shake up mornings, African drumming and much more. We even had active homework. It was a fantastic week. 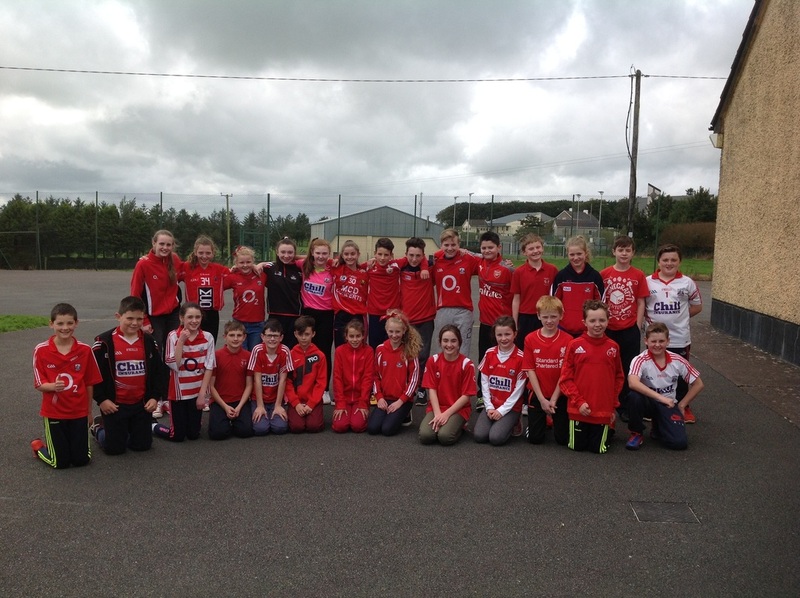 Juniors, seniors and first class thoroughly enjoyed a football blitz recently which Scoil Iosaif also took part in. A huge thank you to Donoughmore G.A.A. for organising this. Second to sixth class put on fabulous performances for their Choral Verse Speaking examinations today. Thank you to our examiner Mr. Hoppley and Ms.Ring for all her hard work and dedication in preparing our pupils. Go raibh míle maith agaibh. A big thank you to all who made such delicious treats to sweeten up our Monday morning. Our cake sale was a great success, thanks also to all the parents who helped this morning. Junior and Senior Infants, First and Second class really enjoyed their recent school tour. Our latest theme in aistear is the airport. Junior infants really enjoyed role playing going on their holidays and the flight to their destination. We painted some lovely pictures, read some books to do with aeroplanes, made some paper planes and created some constructions as part of junk art. A huge thank you to Mrs. Keating for all her assistance with Aistear. Her creativity really inspired the children. They really loved having her in helping out with their art creations. Junior and senior infants had recently been learning about mini beasts so they went on a mini beast hunt around the school grounds. They were delighted with all the different mini beasts they found. Junior Infants recently used the Garda station as their aistear theme. We think there are certainly some future Gardaí in the making. Check out the pictures below. Pupils from Rang 3 - Rang 6 had a fantastic day on their school tour at the Glen Resource Centre followed by bowling at The Planet, Blackpool. They had a jam packed day full of activities which were thoroughly enjoyed by all. 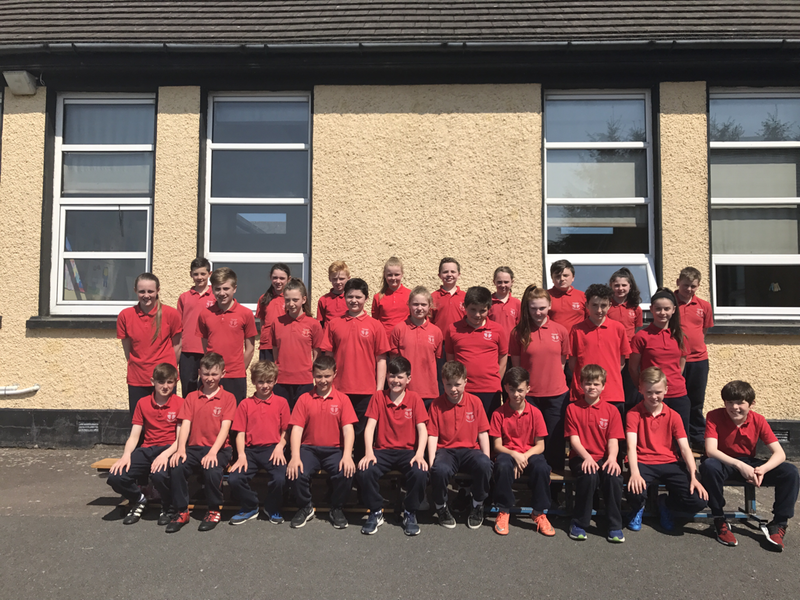 The children of St Lachteens were in celebratory mood today as Members of Donoughmore Athletic F.C., Corinthians Cup Final Winners visited the school . Nine members of the panel are past pupils of the school, it was a fantastic achievement and we were delighted to cheer them on today. Domhnach Mór Abú! 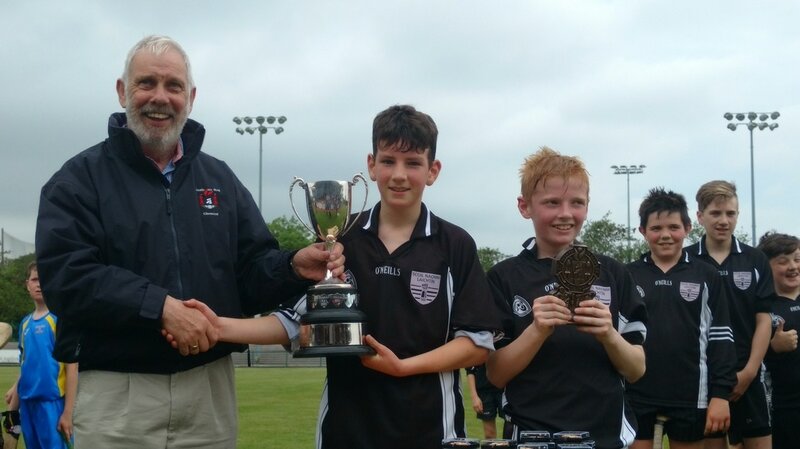 St Lachteens battled it out at C.I.T to emerge victorious against Bartlemy in a tightly fought contest, well done to all involved, all those who trained diligently over the last few months, the superb supporters who attended the match and Mr McSweeney and Mr Condron their trainers.Scoil Naomh Laichtin Abú!!! 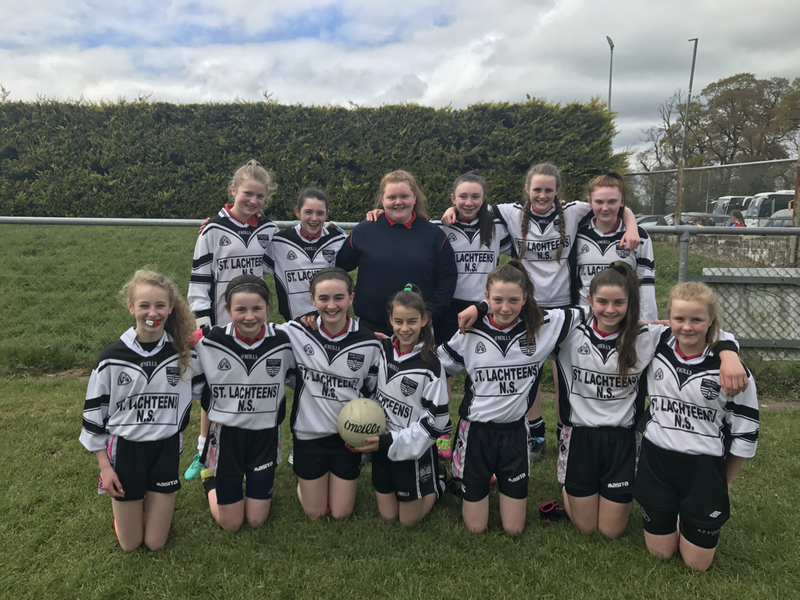 A huge congratulations to the 5th and 6th class girls on their superb performance in the Duhallow Schools Football League and their tremendous effort in the recent final. We are very proud of you all! Thanks also to Ms Murphy and Ms Whooley. 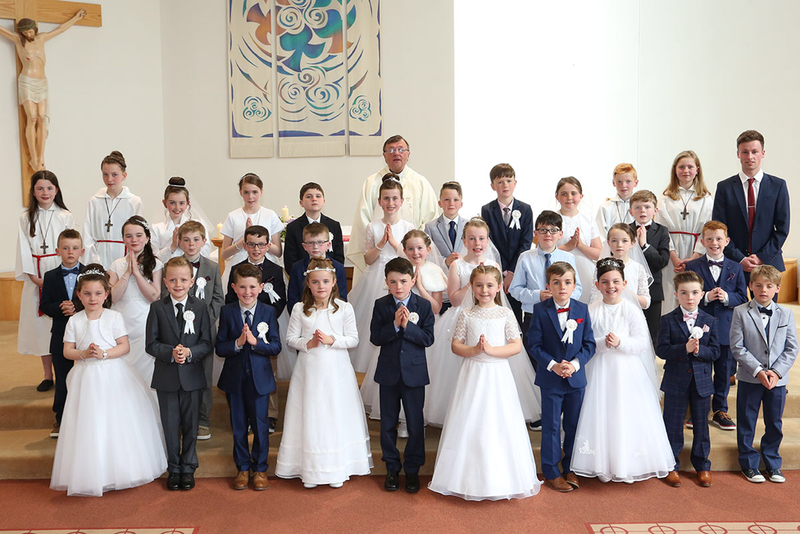 The First Holy Communion class photo, pictured here with Fr O Riordan and their class teacher Mr O Sullivan is available from O'Brien Studios. Phone: 021 4770005. Be active is taking place with first class after school. This is a great opportunity for children to try out a variety of activities in a fun environment. Junior infants recently explored the theme of the optician in aistear. We are delighted to have been awarded our fourth Green School Flag for our work on the theme of Travel. We are also very proud of our first three Green School Flags based on the themes of Litter and Waste, Energy and Water. Well done to our Green School Committee and all who helped us achieve this Green School status. Our pupils from fourth to sixth class are counting down the days to the Sciath na Scol Final. We are very proud of our team for doing so well in the competition and are looking forward to supporting them in the final on Friday 26th May at 11am in C.IT. Scoil Laichtin Abú!!! Congratulations to all our First Holy Communion pupils on this special day. Thank you to all who made today such a wonderful, memorable occassion. Go mbeannaí Dia daoibh. Best wishes to all our pupils receiving their First Holy Communion tomorrow. We hope they enjoy this very special occasion. Fourth class really enjoyed their hour of code today. Congratulations to our fifth and sixth class girls on their superb performance in the Duhallow Football Blitz. Best of luck in the final! Congratulations to our Shining Star Certificate recipients and Kind Kid Raffle winners for the month of April. Third and fourth class really enjoyed their recent tug of war training session and are looking forward to their upcoming competition. Dr. John Morrissey recently visited third, fourth, fifth and sixth class as part of a science initiative with U.C.C. The pupils really enjoyed learning about the brain, the digestive system, bacteria and investigating the amount of sugar in different drinks. Thank you to John for making the sessions so active, informative and enjoyable. 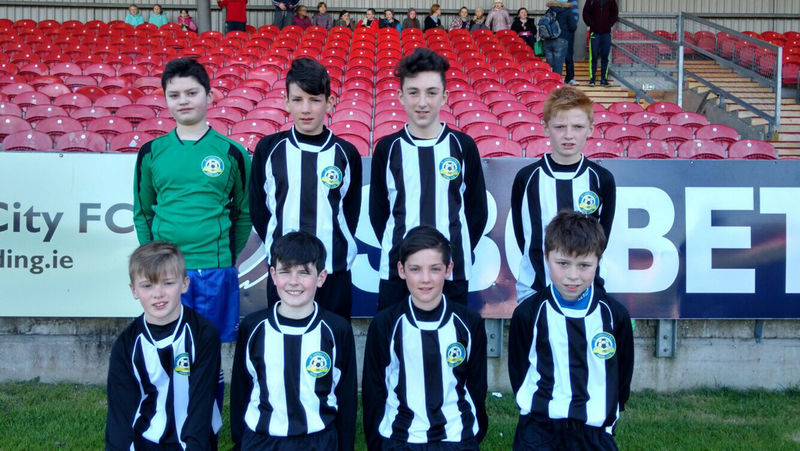 Well done to the boys soccer team who represented our school in today's FAI 5 a side soccer final in Turners Cross. It was an incredible achievement and we are very proud of you all. 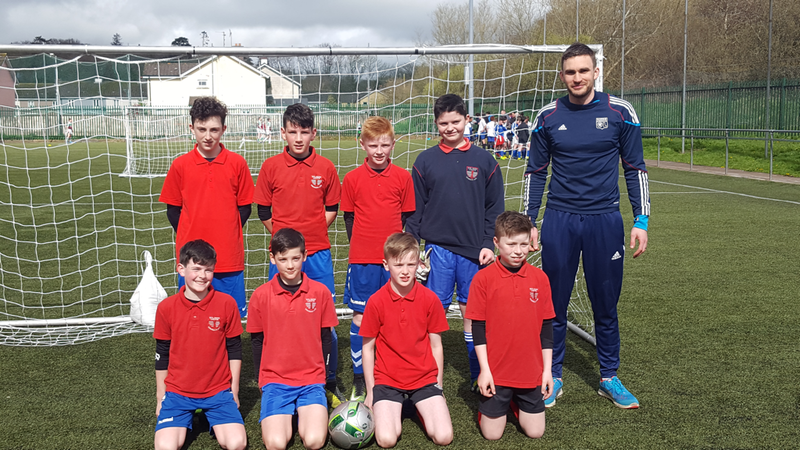 Best of luck to our boys from fourth to sixth class who will be representing our school tomorrow in the FAI 5 a side soccer competition and in the Duhallow football league. We wish you all a very happy Easter. Second Class have been very busy creating their beautiful Easter bunnies. 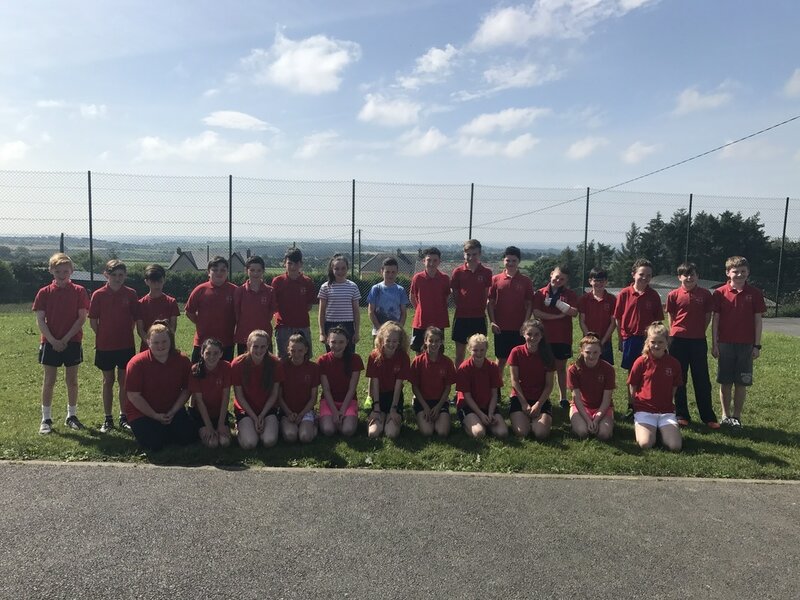 Pupils from third to sixth class really enjoyed the internal basketball league held during lunch time over the past weeks. Well done to all who took part and congratulations to the winners. 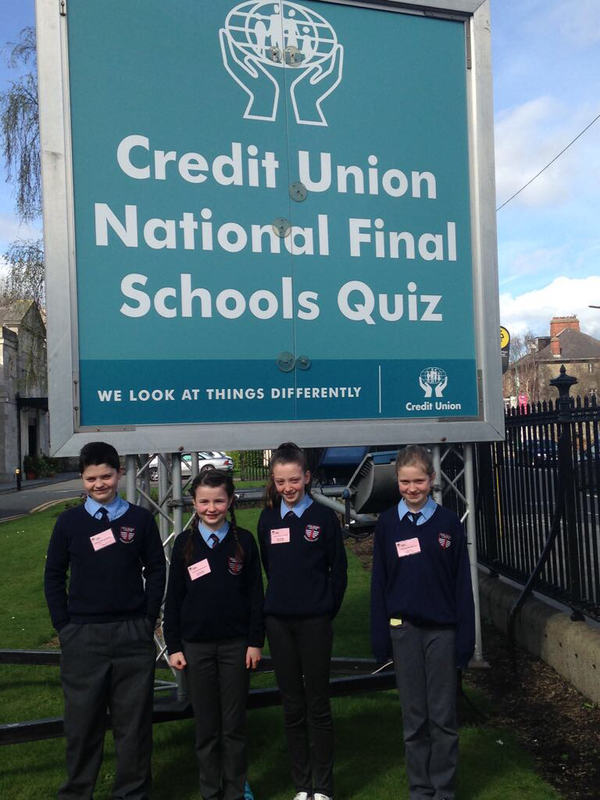 There is great excitement in Dublin this sunny Sunday morning as our U13 quiz team participate in the Credit Union National Quiz Schools Final. We are immensely proud of our team, following their amazing achievements in the regional and county rounds. We wish them the very best of luck and we hope they really enjoy their day in the RDS. Congratulations to the winners of our Kind Kid Raffle and our Shining Star Certificates for the month of March. Our Wonderful Wellness Week concluded today with a very special assembly. We announced the winners for our poster competition from each class. 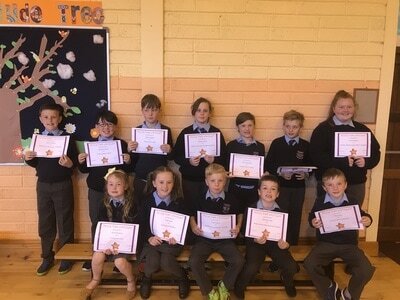 We also had an overall winner and a special prize for all the pupils in third class who overall put a fabulous effort into their posters. The whole school performed "Don't Worry Be Happy" which was really inspiring. Finally pupils from fourth, fifth and sixth have created a wonderful gratitude tree display in the hall over the past weeks. Everyone in school today got a paper leaf and wrote something they were grateful for. We then added a leaf from everybody in the school to our gratitude tree. Our inspirational quote today was "Shoot for the moon. Even if you miss you will land among the stars". We hope you enjoy our pictures. Todays inspirational quote was "Never be afraid to try something new". Today we watched a clip from the Disney Movie Dumbo. In this video the train Casey Jr. was travelling along the tracks when suddenly he saw a steep hill. He was struggling to carry his very heavy load of animals from the circus up the steep hill but he continued saying "I think I can, I think I can". At the end he was delighted and raced down the other side of the hill. This clip reminds us to have a positive attitude and to always continue trying our best especially when we find something difficult. Our gratitude lists are continuing to grow each day and we are really looking forward to tomorrow's assembly. Fifth Class Pupils really enjoyed making "White Chocolate and Rasberry Brownies" this morning. This was another recipe from our local community cookbook "A Taste of Donoughmore". This recipe was contributed by our very own Monica. The beautiful smell was wafting through our corridors this morning. Congratulations to the boys and girls from 4th to 6th who participated in today's Sciath na Scol hurling game against Aghabullogue. Todays inspirational quote was "The longest journey starts with a single step". We are continuing work on our gratitude list and there is a lot that we are grateful for. Tonight's homework was to do some enjoyable exercise at home. Today we had a great day with our special guest wellbeing coach Susan Fitzgerald. The pupils really enjoyed yoga and meditation. Our homework for tonight is to talk about a happy memory with someone at home and continue our gratitude list. Our inspirational quote for the day is "Never, never, never give up". Wellness Week got off to a great start. We started our week with some quiet, reflective time as we coloured our mandalas. Our inspirational quote for today is "No one can do everything, but everyone can do something." Our homework for tonight is to listen to our favourite piece of music and begin our gratitude list of writing three things that we are grateful for today. The boys who took part in FAI 5 a-side football competition in O'Shea Park, Blarney really enjoyed the day. Congratulations to the boys on qualifying for the next stage of the competition. Girls from 1st to 6th class really enjoyed the last six weeks camogie training with Esther O' Leary. 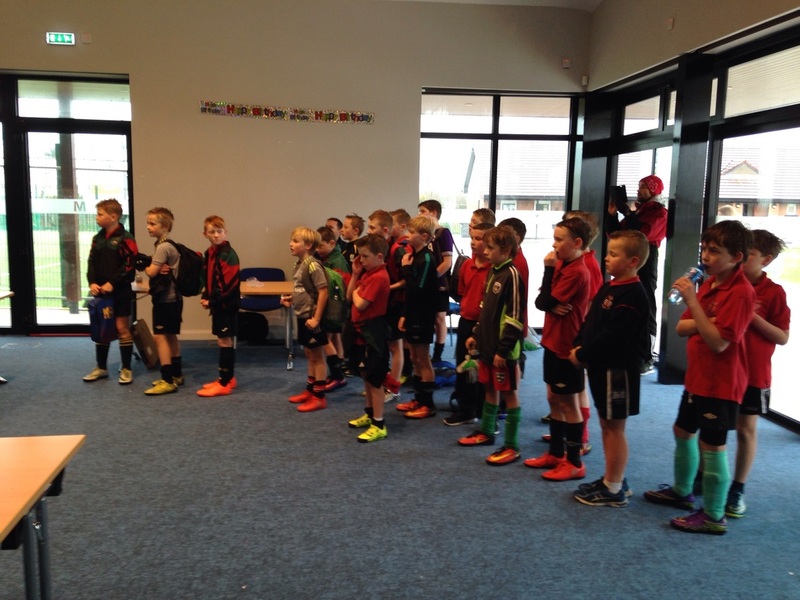 They had great fun and their skills improved greatly from week to week. Go raibh míle maith agat Esther. Our quiz team are busy preparing for the Credit Union Quiz National Final in Dublin on April 2nd. We are immensely proud of our team and their incredible achievement. Thank you to Anthony Forde the Manager of Blarney Credit Union who visited our school today. 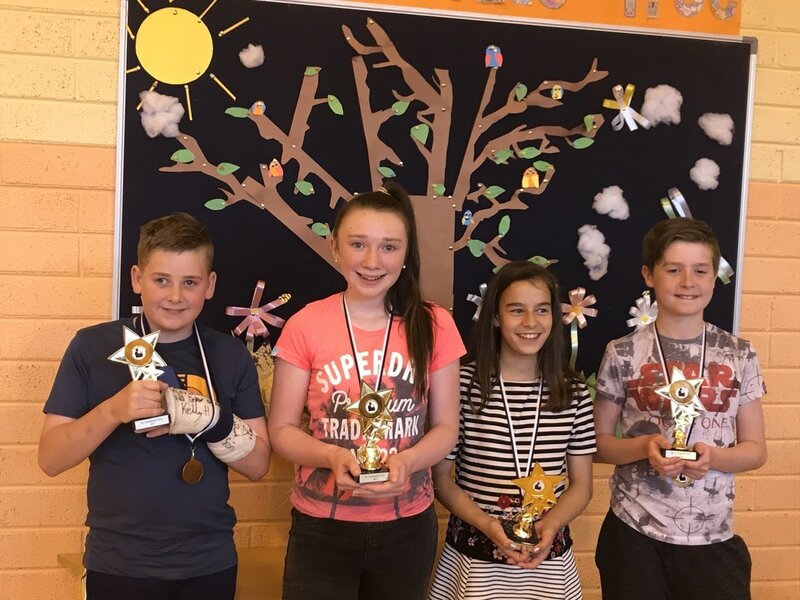 Congratulations to the winners of the Donoughmore G.A.A. Home Dressing Room Competition. Our pupils enjoyed creating inspiring slogans for the dressing rooms in Lackabawn and our three winners were delighted with their voucher for new club gear. Bhain na paistí i rang a cúig agus a sè taitneamh as na gníomhaìochtaí èagsúla a bhí ar siúl againn i rith seachtain na gaeilge go hàirithe an Caife Comhrà, an Tràth an gCeist, Biongó agus an Toraíocht Taisce. Fifth and sixth class really enjoyed the differenct activities we took part in as part of Seachtain na Gaeilge, especially our Irish Cafè, Bingo in Irish, Quizzes and Treasure Hunt. Senior Infants had great fun exploring the theme of the dentist in aistear. Thank you to all who attended and helped in any way to make our bingo fundraising night such a success. Pupils really enjoyed playing Bingo in preparation for tomorrow nights Fundraiser. Well done to the winners. Check out our Fundraising page for more information. 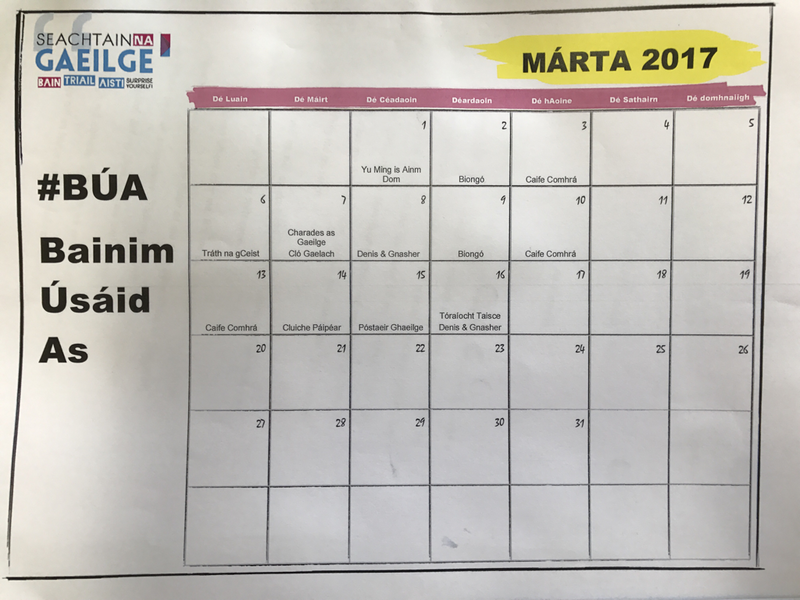 Tá na páistí i rang a cúig agus a sé ag baint taitneamh as na gníomhaíochtaí éagsúla atá ar siúl againn gach lá don Seachtain na Gaeilge, 1ú - 17ú Márta 2017. The pupils in 5th and 6th class are really enjoying the different activities we are partaking in each day as part of Seachtain na Gaeilge 1-17th March 2017. 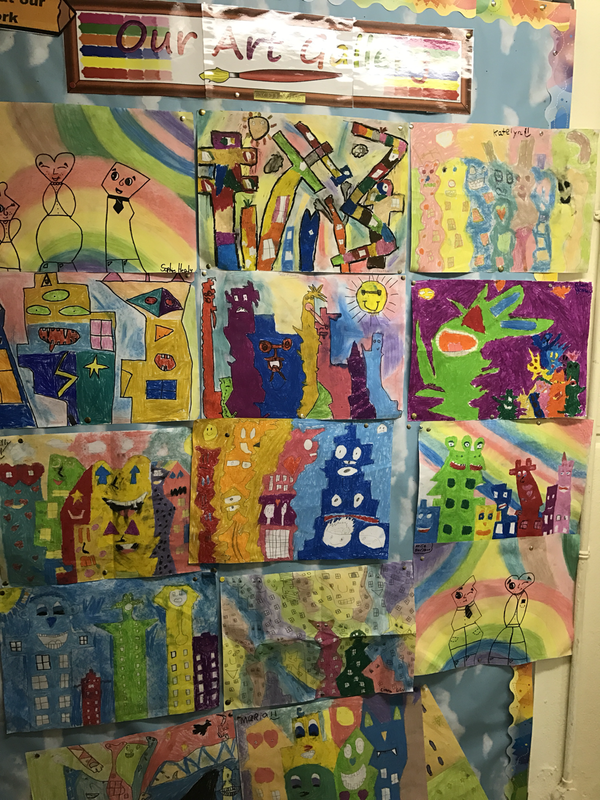 Pupils in fifth and sixth class created some wonderful pieces of art following their recent engagement in looking and responding activities to artist James Rizzi. Our runner beans, baby carrots and cress are growing in fifth and sixth class. We are enjoying monitoring their progress and can't wait until they're ready to harvest. Fifth and Sixth Class engaged in a positive poster campaign as part of our recent engagement in Safety Internet Day and as our school engages in positive mental health promotion as part of our Health Promoting School activities. We are immensely proud of our school quiz team who came 2nd in the county round of the Credit Union Quiz. They will now represent our school, our parish and our county in the National Final in Dublin on April 2nd. Congratulations to all involved, it is an incredible achievement. Our annual in school Basketball Blitz will commence this week. All pupils from third to sixth class are very excited. Click here to see the teams and schedule. Fourth class enjoyed exploring 3D shapes in maths. Second Class got active in maths as they measured metres, more than and less than metres. Pupils in fourth class had great fun making and eating their delicious pancakes. Fifth and sixth class enjoyed tasty pancakes in school today. Fourth class really enjoyed their recent science experiments with rocks. Congratulations to the recipients of our Shining Star Certificates and Kind Kid raffle winners for February. Junior infants had lots of fun as they explored the theme of the dentist in Aistear. Second Class made lovely hearts for Valentines Day. Happy Valentine's Day from Junior and Senior Infants. We made some teddy bear cards. We used a special stamper on some bread which said 'I ❤️ you'. We then got to spread some butter and jam on the bread and enjoyed eating it afterwards. Our school took part in the Operation Transformation 10@10 activity. As part of their ten year anniversary Operation Transformation invited schools to take part in 10 minutes of exercise at 10 o'clock on Friday 10th February. We really enjoyed it! 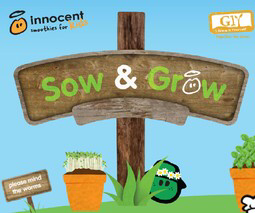 Fifth and Sixth Class were very excited to take part in the Sow and Grow initiative organised by Innocent and GIY. It encourages children to grow their own vegetables. We have sown baby carrot seeds, cress seeds and runner bean seeds. We are looking forward to germination and can't wait to harvest our vegetables. 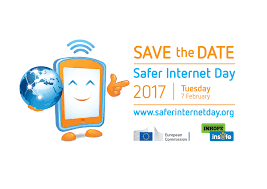 We learned lots about Internet Safety as part of Safer Internet Day 2017 on Tuesday 7th February. 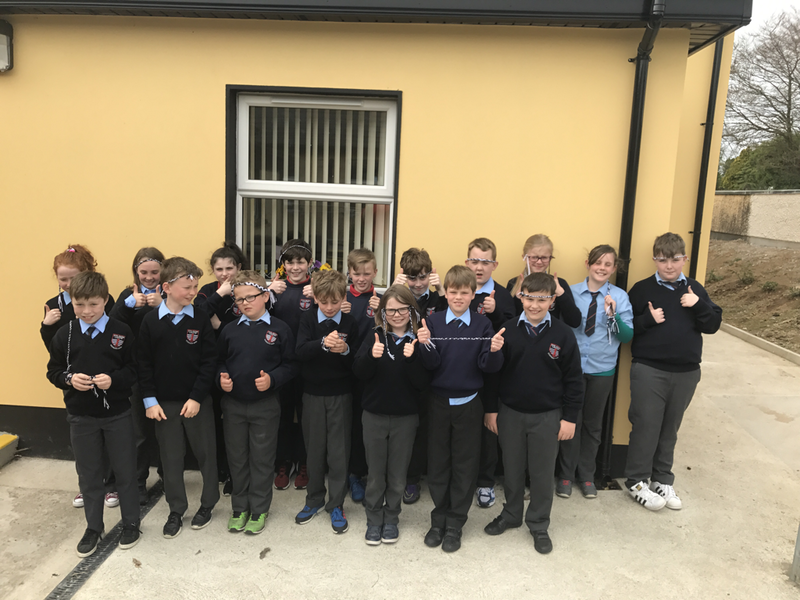 We really enjoyed the internet safety rap and fifth and sixth class designed positive slogan posters as part of a positive poster campaign. Fifth class have made some delicious recipes from our local cookbook "Taste of Donoughmore". In the last few weeks they made a tasty banoffee pie and cottage pie. They learned a lot during the process and are looking forward to their next cooking session. Second Class combined their art with procedural writing as they wrote instructions for blowing a bubblegum and created a beautiful display. They also designed colourful zentangles. They really enjoyed constructing and playing with hula huts as part of P.E. Là Fhèile Brìde, Happy St. Brigid's day. To celebrate the feast day of St.Brigid and the first day of spring we made St.Brigid crosses and discussed her life and stories associated with this important Irish saint. Click here to read about St.Brigid. Click here for instructions on how to make St.Brigid Crosses at home. 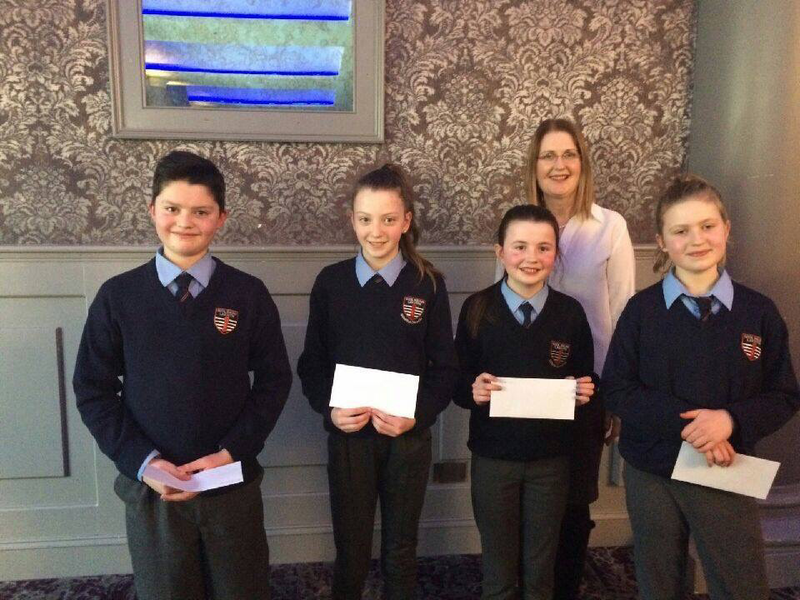 We are immensely proud of our U13 Quiz Team who came first and our U11 Quiz Team who came second in the Blarney Credit Union Quiz. A huge congratulations to all involved on their fantastic a achievement. Congratulations to all the pupils who were recognised for their hard work and kindness in our January Assembly. Our Kind Kids box was overflowing with lots of Kind Kids cards, a great start to 2017! We wish you all a very Happy New Year. Welcome back to St. Lachteens N.S. We are all looking forward to another exciting term ahead. Our January calendar has been uploaded to our upcoming events page so you can follow our upcoming activities for the month. We wish everyone a very happy Christmas. We look forward to seeing you all in the new year on Monday 9th January. We were privileged and delighted to welcome Frankie Honohan, Rena Buckley and Mairèad Corkery to our school with the Brendan Martin Cup. They gave us very useful advice and answered lots of interesting questions. 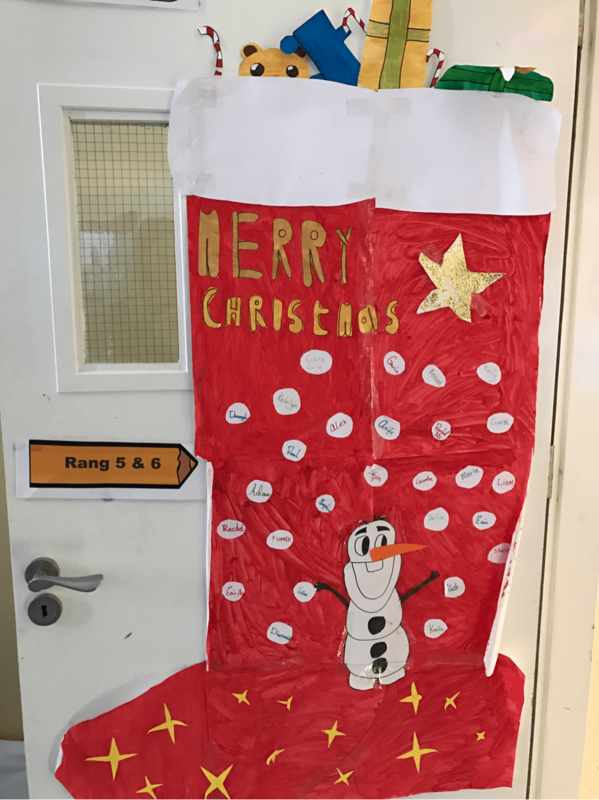 There was great excitement in fifth and sixth class as the pupils decorated their Christmas Logs. This annual event has become a highlight for the pupils. They showed great imagination in their fantastic designs. Picking the winners was a very difficult task. Well done to all! Our last topic for this term in aistear was Christmas. This was really enjoyable. We made some melted snowman biscuits (and got to eat them-yum). We decorated a Christmas tree, made some play dough decorations and lots lots more. Senior infants had a great time in aistear. We had a wrapping station where they coloured wrapping paper and wrapped presents. We had a construction station where they built toys and checked to make sure they were working and safe to use. We had an art area where they created Christmas cards. In our role play area we even had Santa Claus heading off on his sleigh to deliver the presents. Congratulations to the recipients of our Shining Star Certificates for December. Well Done also to the winners of our Kind Kid Raffle. We had an extra raffle this month for Christmas. The name of every boy and girl in the school was entered into a raffle for a box of sweets. There was great anticipation as we waited excitedly for the lucky winners to be drawn. Our Christmas Hamper Raffle this year was a great success. Thank you to everyone who bought raffle tickets and to those who brought in lots of beautiful items for our hampers. 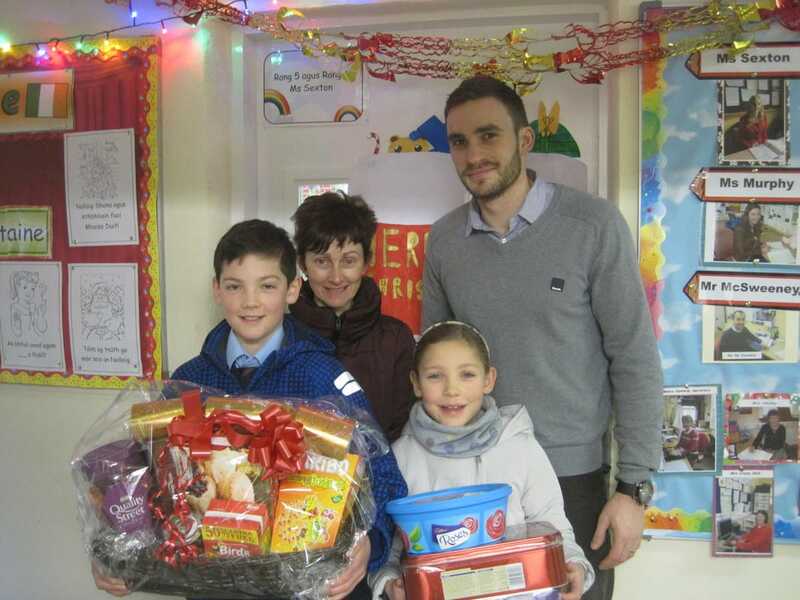 We were delighted to present one of these hampers to St. Vincent De Paul. Fifth and sixth class really enjoyed creating Christmas floral arrangements today in school. Excitement is building in St. Lachteens N.S. as Christmas approaches. First class made fabulous snow globes in art today. We were delighted to celebrate mass with our grandparents on the 8th of December. It is a very special day in our school year. Our grandparents mean so much to all of us and it was great to see them in our school. Thank you to everyone who atteneded and to all who helped us for this lovely occasion. Junior Infants really enjoyed their recent trip to our local Oifig an Phoist. They learned lots and even posted a few letters. Senior infants have been thoroughly enjoying aistear where our topic is the toy shop. They are busy using their imaginations to create lots of different toys. Second Class are preparing for their very special First Holy Communion Enrolment mass this Sunday 4th December at 11.30am in St. Lachteens Church. We are really looking forward to Grandparents Day. It's a very special day on our school calendar. 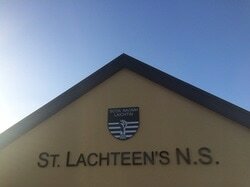 Mass will be celebrated at 11.30am on the 8th December in St. Lachteens Church. All are welcome to join us in the school hall afterwards. 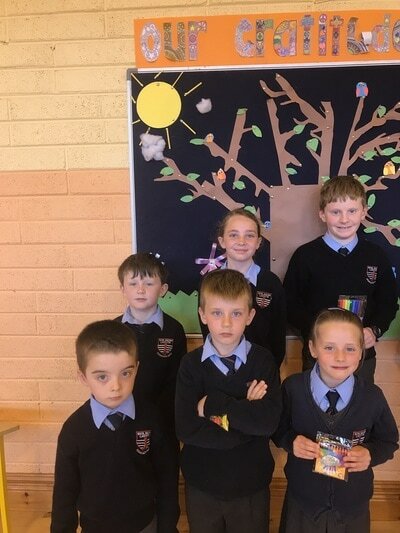 All pupils in the school recently took part in an art competition organised by Donoughmore Macra na Feirme. 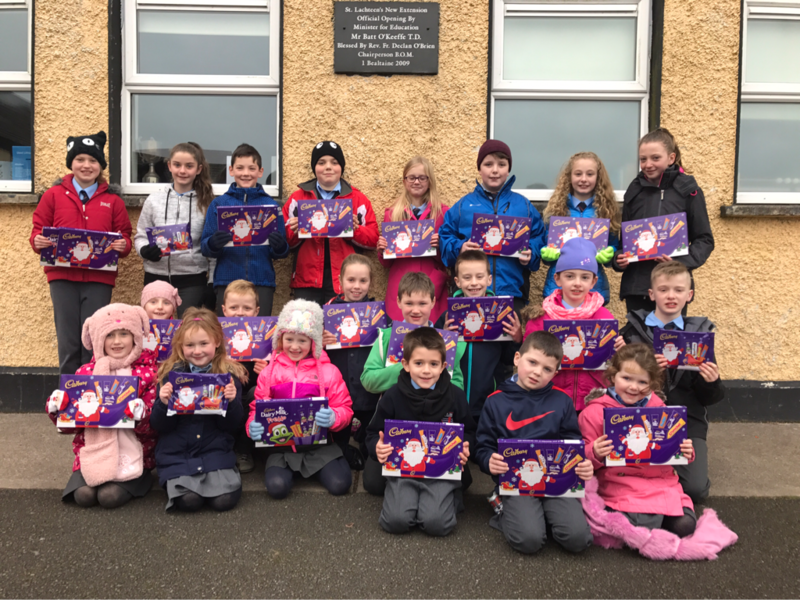 Pupils from junior infants to second class participated in a colouring competition, while pupils from third class to sixth class created wonderful art based on the theme of Christmas. The pupils put such great effort into their art that we also had an internal competition for each class. Well Done to all the prize winners. Congratulations to the recipients of our Shining Star Certificate and Kind Kid Cards for the month of November. Well done, keep up the good work! Fifth Class made delicious Potato and Leek Soup using a recipe from our local cookbook "A Taste of Donoughmore". They really enjoyed making it and loved the taste on a cold winters day. Fifth and Sixth Class put on a fabulous Science Display as part of Science Week 2016. Each pupil researched, presented and explained an experiment to their class including Non Newtonian Fluids, Lava Lamps, Hovercrafts, An Anti - Gravity Water Bottle, The Runaway Pepper, Floating Eggs, Potato and Straw Air Pressure, Dancing Raisins, Tornado in a Bottle, A Rocket Balloon, Tye Dye Milk, An Exploding Bag, The Drip, The Fizz Inflator, Heating up a Solid, A Tornado in a Jar, Soap Powered Boat, Balloon in a Bottle and a Coke and Mentos Explosion. It was thoroughly enjoyed by Ms.Sexton and all in fifth and sixth class. Well done all!! Second class were busy making Ninjas in art this week! Well Done to the recipients of our "Shining Star Certificates" for October. Congratulations to the winners of our "Kind Kids Raffle". We wish everyone an enjoyable Halloween Break. We hope you enjoy our fantastic Halloween Disco organised by our Parents Council. Check out Junior and Senior Infants Halloween art. They really enjoyed making their spiders. Fifth and Sixth Class enjoyed making Spooky Skeletons! Fifth and Sixth Class really enjoyed making "Hedgehog Cakes" from our local cook book "Taste of Donoughmore". They were delicious! Junior and Senior Infants had great fun going on a nature walk. They looked at some different trees and collected some leaves. They also did some tree bark rubbings. Junior and Senior Infants listened to the story "The Gruffalo". They had great fun making Gruffalo Krispies. They looked and tasted delicious. Yummy! Junior and Senior Infants really enjoyed their shape search. Fifth and sixth class really enjoyed Maths Week 2016 in fifth and sixth class. They watched a live streaming of a "Living Maths" show especially for Maths Week 2016. They collected lots of data in our school during the week and analysed it. They also participated in "Maths Eyes" competitions in school. They went on a maths trail around the school yard and community centre. They collected lots of information which they then presented to the class through their "Maths Eyes" posters. Each pupil in the class also completed an individual challenge. They listed everything they saw related to maths at home during the week and there were individual prizes. Well done to the prize winners and all pupils! 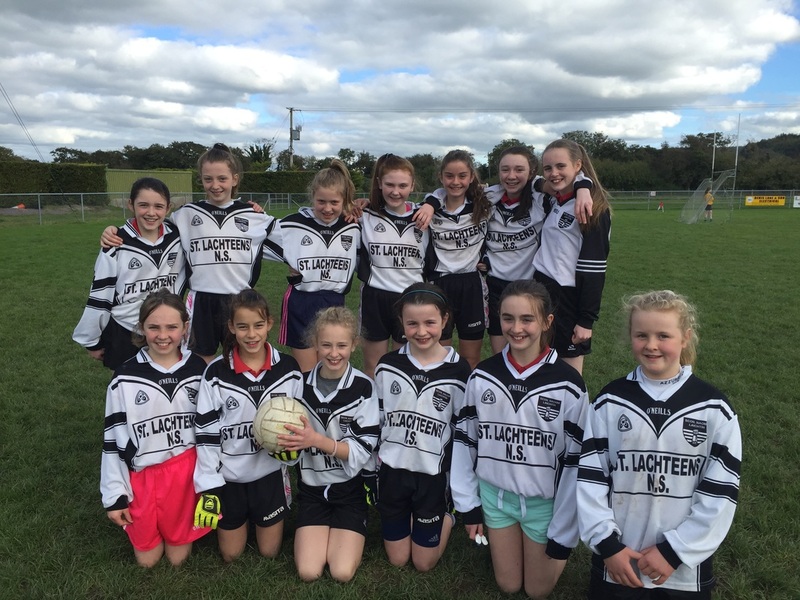 Well done to our fifth and sixth class girls who recently participated in the Duhallow Football Blitz in Rathcoole. A fantastic day was had by fifth and sixth class boys at a recent Tug of War Tournament in Firmount N.S. Many thanks to Firmount N.S. and the members of the Donoughmore Tug of War team Sean Honohan, Mick Hartnett and Brian Buckley for a great day. Third Class enjoyed their recent local nature walk as part of Tree Day. They walked around our local area and observed the trees that are growing there. 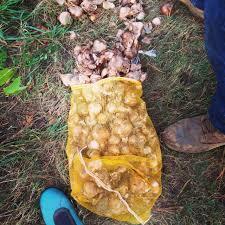 We received a donation of lots of daffodil bulbs , each pupil will plant one at school and one at home. We look forward to planting the bulbs and watching them grow. The teachers and SNAs will get a bulb too. Can you work out how many bulbs we will need? There are 154 pupils, 8 teachers and 3 SNAs. Some pupils in Rang 6 are in charge of counting out and distributing the bulbs. Daffodils are sown usually from September to November. BUMBLEance, the national children’s ambulance service, came to school to talk to Rang 3 and Rang 4 , we got to explore inside the ambulance and ask lots of questions. The BUMBLEance carries sick children to hospital. We got a lovely Bumblebee teddy, Rang 4 want to use him as their class mascot. Fifth Class thoroughly enjoyed their first cooking experience in school. They made malteser cheesecakes - their first recipe from our local cook book. They looked really tasty! Congratulations to all our shining stars in St. Lachteens who received awards for excelling in a particular area over the month of September. Well done also to our "Kind Kid" recipients. All children in St. Lachteens make a great effort to be kind to their peers and when an adult spots one of these acts of kindness the pupils receive a "Kind Kid" card and are entered into a draw for the next assembly. We are looking forward to our next assembly - Keep up the good work! We were delighted to receive a copy of the Donoughmore cook book today "A Taste of Donoughmore". This cook book is packed with many delicious recipes submitted by members of our community and published by the Donoughmore Community Centre Ltd. Fifth Class cannot wait to begin trying out these wonderful recipes in the coming year. 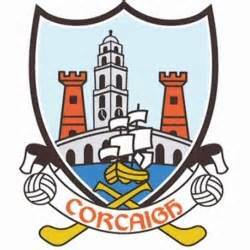 We all wore red today in support of the Cork Ladies Footballers who will play in the All-Ireland Final on Sunday. We wish all involved the very best of luck! A big welcome back to a new school year in St. Lachteens National School. We especially welcome our new junior infants and their parents as they begin their school days with us. We are looking forward to an exciting new year ahead! Children's work and photographs copyright St Lachteens NS - please ask for permission before using.